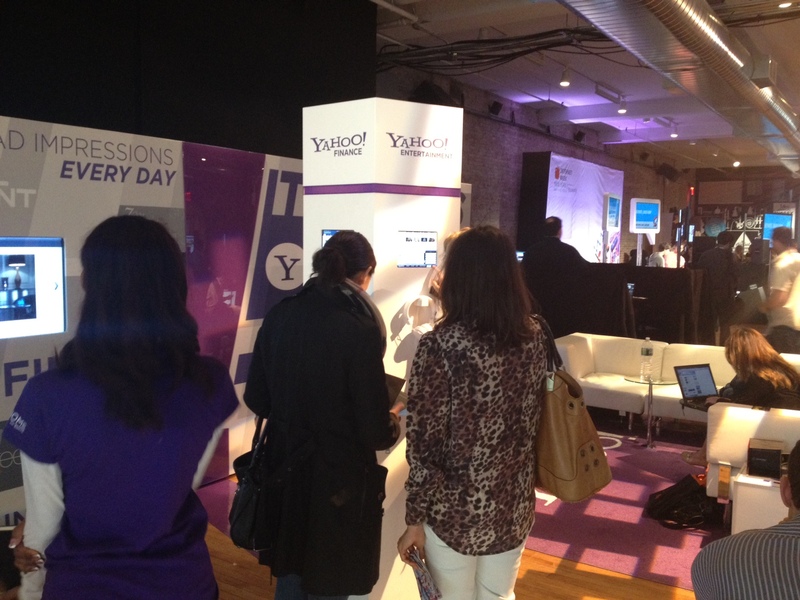 Beyond Traditional at Internet Week New York! A few members of the Beyond Traditional team are out for the week to help Yahoo! make a big impression at this year’s Internet Week New York. At only a couple of days into the event, being held in the heart of NYC’s chic SoHo neighborhood at the 82 Mercer Conference Center, Yahoo! has turned heads and has already risen to become one of the most popular exhibitors of the Week. Beyond Traditional, in charge of all design–from concept to execution, transformed Yahoo!’s event space into a hip lounge area where event goers were invited to hang out, watch Yahoo!-related content, interact with Yahoo! media and even pose for a custom photo to commemorate the event. Video walls and pentagonal pillars, featuring touch-screens synced with web apps, separated the event space and broadcasted sizzle reels, interactive experiences, video content and live media from Yahoo! Finance, News, Sports, Screen and Entertainment to Internet Week attendees. In front of a behemoth purple depiction of the New York City skyline, guests put on their best socialite impressions and posed for a photo–once taken, the photo was instantly uploaded and fit into one of five tabloid-themed frames that users could choose from to customize their souvenirs. In addition to crowds of techies, Yahoo! lounge visitors have also included the NYC mayor and resident multi-billionaire, Michael Bloomberg. Check in soon for more information and photos from the event!